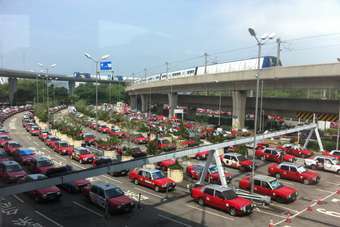 Blog: Why so few Chinese cars here in Hong Kong? A stop over in Hong Kong provides a great opportunity for car spotting. But where are all the Chinese brand models? Despite countless trips between London and Sydney, this is my first visit to Hong Kong. Last time my halfway stayover was Incheon/Seoul and before that it's been Johannesburg, Singapore, Tokyo or Kansei/Osaka, but I'm pleased to discover 'Hong China China' as the postcards term it, has proved to be just the ticket for a restful break on the long journey to the land down under. Me being geeky me, I can report that I already knew that Crown Motors, Toyota's partner in Hong Kong, is the local market's long time number one player. The rows and rows of Toyota Crown Comfort taxis attest to that too, as do the Alphard and Vellfire minivans which act as shuttles for the hotel where I am staying. Perhaps surprisingly, there are relatively few Chinese brand cars on the roads. It's the money of course - Hong Kong has always been one of those markets where premium brands sell extremely well, with Mercedes-Benz, Audi, BMW and Lexus, as well as Volkswagen all highly successful here despite the huge import taxes. Lexus, in fact, set a sales record in 2011, with a combined total of 7,800 Toyota and Lexus sales last year, a YoY rise of 13 percent, Crown Motors claims. And what of the British legacy? Well, it's been almost a decade and a half now since Prince Charles and former governor Chris Patten set sail out of HK harbour, let's not forget. So apart from the same electrical sockets in my hotel room as I have at home, and the sight of a fair few Range Rover Sports cruising about - number plates use the Roman alphabet and the white front/yellow rear British system - this feels firmly like Asia, not an outpost of Empire. Meanwhile, US English has become the default standard for signs, I notice. I now regret not booking to stay longer in Hong Kong, particularly when, from where I am sitting using the wifi at a cafe within Chek Lap Kok airport, I can see signs which wish to entice me towards 'Transport to Mainland China': Shenzen, for example, is more or less just across the water from here. I enquired earlier at one of the special kiosks which organises visitor visas for China to see if I could zip over, have a look around, and be back for this evening's flight. Alas I must wait half a day for the paperwork to be processed, plus the fee is a steep HKD 1,500 (150 euro). I'll be returning here in a few weeks' time, so perhaps I'll venture across then. Sad to say I couldn't snap a decent panorama photo to accompany this blog - flying in yesterday the city and its mountainous backdrop looked magnificent, but today there is a heat haze shrouding the airport and nearby Lantau Island, which is sadly also masking the nearby New Territories and Mainland China. Still, warm weather is most welcome after the long English winter. Let's hope the temperature in Sydney is as welcome as the 30 celsius of Hong Kong when I land down there tomorrow morning.